Canoeing throughout Algonquin Provincial Park in Ontario, Canada is a peaceful outdoor activity where you are surrounded by the natural beauty of the wilderness. Old tree stumps, lily pads and marshland grass covers the landscape on and around the pond area. Canoeing on a pond in Algonquin Provincial Park, Ontario, Canada. 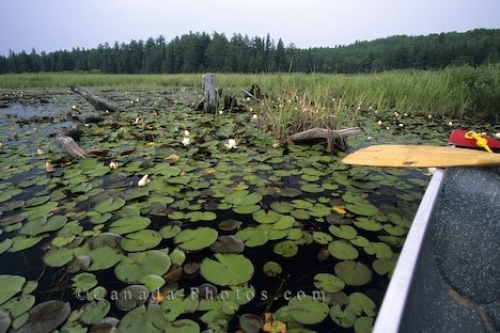 Picture of a canoe on a pond where lily pads cover the surface of the water in Algonquin Provincial Park in Ontario, Canada.